The preauction estimate of this wonderful clock is set at $35,000. It would be great if someone local can purchase it. It's hard to imagine just how ornate the decorations of the theatre were--this is but one item of hundreds that graced the theatre. 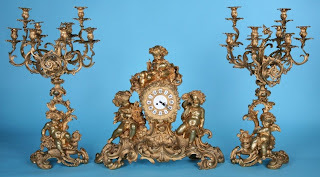 Friends of the late Joseph R. DuciBella, the noted designer and theatre historian from Chicago who died earlier this year, have related that his antique bronze clock and candelabra pair from the UPTOWN THEATRE, Chicago, will be auctioned from his estate on Sunday, Nov. 25, by Bunte Auction in Elgin, Illinois. The large, heavy and now highly valuable ensemble decorated the UPTOWN's interior atop a large chunk of antique furniture in the Magnolia lobby near the first-floor ladies lounge, which has a French Renaissance theme. Joe loved to tell the story of how different managers allowed him to take things of historical interest home during his tenure there and how they were amused that anyone would want them. (He worked for Balaban & Katz during his youth.) However, a reliable source says that Joe obtained the clock set after it had been bought from the theatre and moved along with UPTOWN WurliTzer theatre organ to the HOOSIER THEATRE, in Whiting, Ind. The clock, Joe said, was missing pieces and did not work when he got it --nevermind that the three pieces were black as coal. Think of the accumulated tarnish and dirt of the theatre and the thousands of curious fingers that had touched it! Joe also recalled how his mother shrieked when she walked into the bathroom and found all of the blackened putti that adorn the pieces soaking in the clean, white bathtub. Of course Joe cleaned the clock meticulously and had it restored to working order. The clock set was one of the highlights of the dining room in his National Register home in Wicker Park on Caton Street that also included Mikado-styled light fixtures that were said to be from the Marshall Field Mansion. Joe was certainly proud of the clock and included it in all tours of his home and in the typewritten tour guide! It would be a wonderful gesture if a deep-pocketed admirer of Chicago history and Joe's collection would find a way to keep it in Chicago and/or on display in some appropriate setting. home wherein the clock's chime could be heard. It is both beautiful and haunting. I'm not exaggerating when I say that I felt it contained something of the soul of the building. The sound on the tape chilled and confused me until I figured out what it was. The UPTOWN clock's ethereal chime is a gentle but articulate voice from an age that has long since passed, leaving few traces or memories.